Elk Burgundy, or better referred to as Bourguignonne, is cubed meat slow cooked with bacon, burgundy wine, brandy, pearl onions, mushrooms and seasonings. Serve over cream style mashed potatoes or polenta. You can substitute venison in place of the elk. Sear cubed elk meat in bacon drippings until browned on all sides. Do this in batches so not to over crowd the pan. Remove and set aside. Add diced onion and chopped garlic and sauté until translucent. Add meat back to Dutch oven. Sprinkle flour over meat and stir to coat. Place in oven for 5 minutes. Stir meat and continue to bake for 5 more minutes. Remove from oven and reduce temperature to 350 degrees. 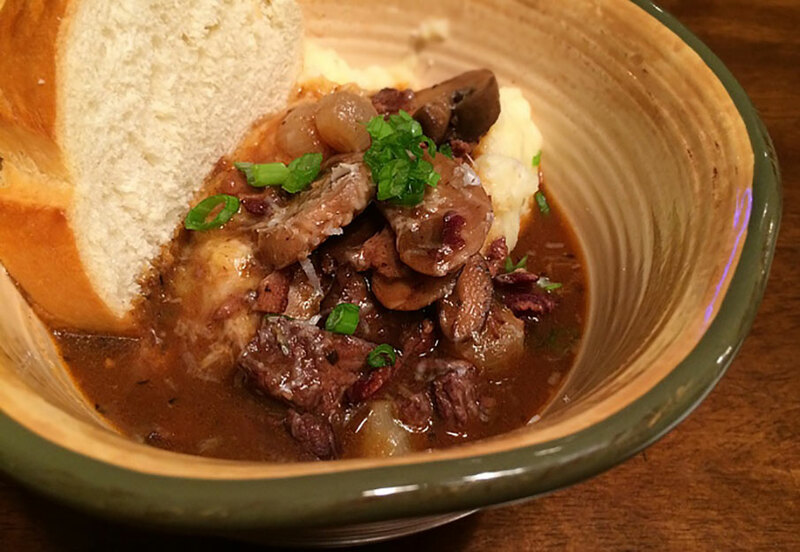 Serve Elk Burgundy over cream style mashed potatoes or polenta. Garnish with chopped green onions.